All acessoried you need to mount your outdoor tv antenna / satellite dish to your roof is included. Universal TV antenna mounting pole is a quick and suitable mount for adding antennas to any mounting situation. The antenna pole can quickly suitable for various installation - Antenna mount can be set up for roof, attic or sidewall installations. 1. Select a best mounting location. Best tv antenna accessory for you to mount your outdoor antenna. With best size design, it can fit most outdoor antennas. 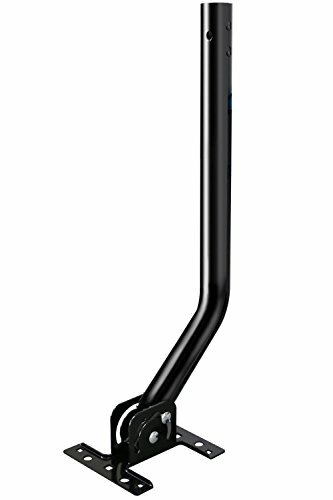 The antenna mounting pole can be rotated 60° for best reception angle to get strongest signals. Both ends of the J-pole antenna mount can be used. Attic Antenna Mount Comes with all the screws ,plastic anchors, and instruction,super easy to assemble. If you have any questions about this product by Pacoso, contact us by completing and submitting the form below. If you are looking for a specif part number, please include it with your message.